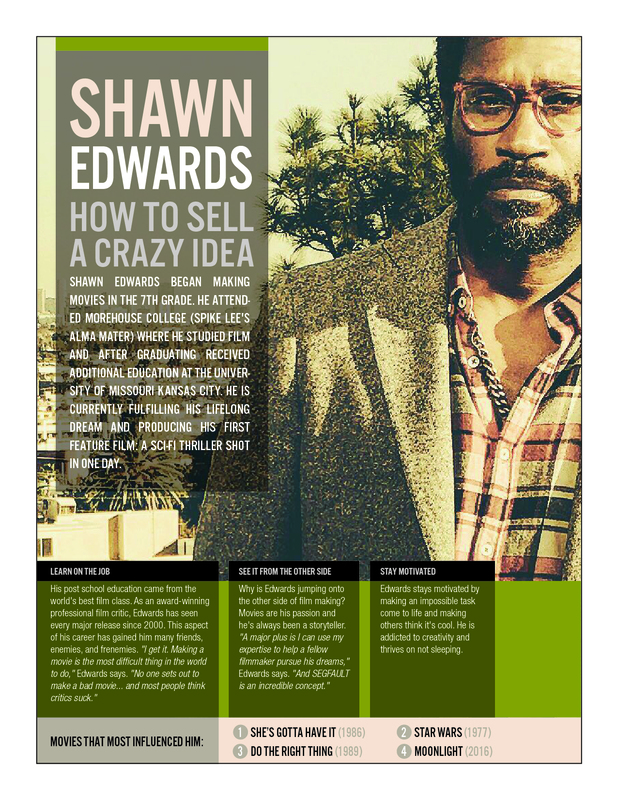 SHAWN EDWARDS BEGAN MAKING MOVIES IN THE 7TH GRADE. HE ATTENDED MOREHOUSE COLLEGE (SPIKE LEE’S ALMA MATER) WHERE HE STUDIED FILM AND AFTER GRADUATING RECEIVED ADDITIONAL EDUCATION AT THE UNIVERSITY OF MISSOURI KANSAS CITY. HE IS CURRENTLY FULFILLING HIS LIFELONG DREAM AND PRODUCING HIS FIRST FEATURE FILM: A SCI-FI THRILLER SHOT IN ONE DAY. Edwards stays motivated by making an impossible task come to life and making others think it’s cool. He is addicted to creativity and thrives on not sleeping.